Marcus Cocceius Nerva was a distinguished lawyer who served as Consul with Vespasian in 71 AD and with Domitian in 90 AD. Nerva had won the favor of the imperial court since the time of Nero. His legal advice, help establish the policy of succession for the throne, which helped maintain political stability during most of the 2nd century AD. It is said that when Domitian inquired with his astrologers as to who would be his successor, given the fact that he had no male heir, the name of Nerva was first put forth. However, since Nerva was much older than Domitian, he laughed and ignored the prediction. 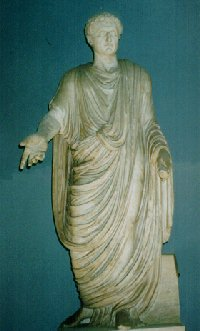 Domitian was assassinated in a palace plot involving his wife Domitia, the Prefect of the Praetorian Guard and several others. It is quite possible that Nerva was part of that conspiracy. In any event, upon the death of Domitian, Nerva was immediately offered the throne and he accepted. Nerva was was proclaimed Emperor by the Senate. Nerva was a wise choice, being a man of conservative nature who would undoubtedly prove to be a fair ruler. 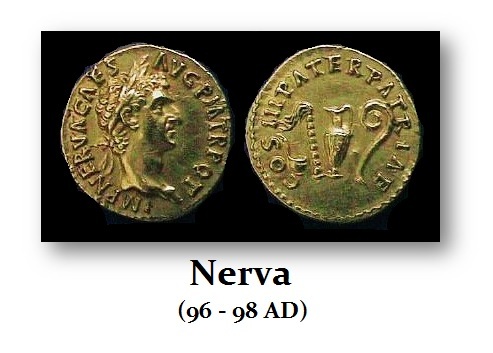 However, at the time of his accepting the throne, Nerva was already 66 years old, being born in 30 AD. Nerva promised to end Domitian’s reign of terror. This promise, however, soon revealed that the corruption was far deeper than he imagined. Domitian had bought the army’s loyalty with large pay rises and when he was murdered, the army wanted revenge. The Praetorian Guard stormed the palace and demanded that those responsible be executed. Nerva faced the soldiers and offered his own life by baring his neck to their swords. The soldiers merely laughed and went on to kill many of Domitian’s friends and allies. The Guard had also forced Nerva to dismiss the two Prefects Norbanus and Petonius Secundus. 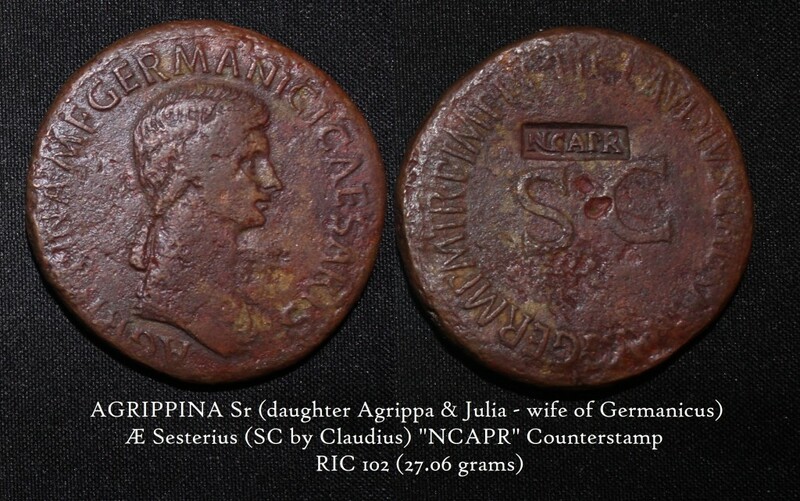 They were replaced by the Guard’s choice of Casperius Aelianus. Aelianus led an attack on the palace demanding the execution of the assassins of Domitian. Nerva had little choice and thanked them for carrying out justice. Nevertheless, Nerva was seriously humiliated and the extent of his power was questionable. Nerva knew he needed an heir who would be acceptable to the military. 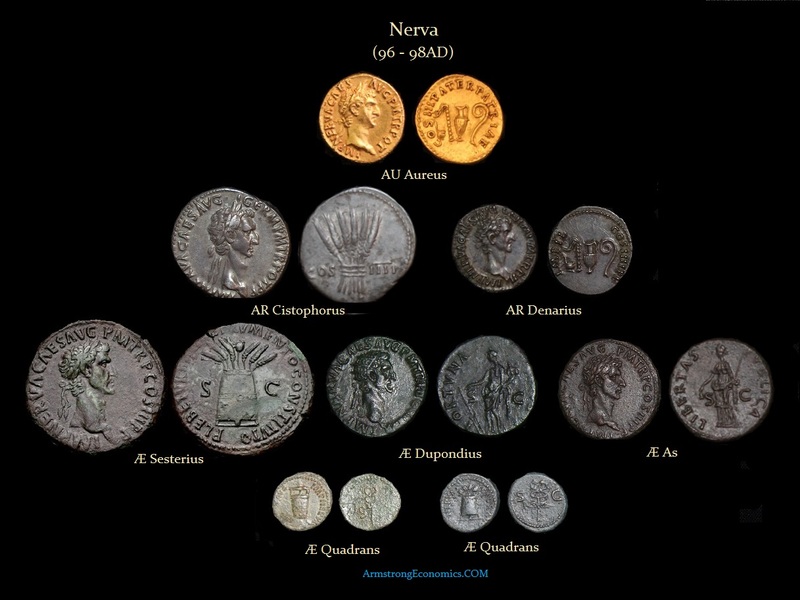 Nevertheless, during his short reign (96-98 AD), Nerva did much to improve the conditions of the state and its economy. He instituted a welfare system to provide food for the poor. This would be maintained by his successor. 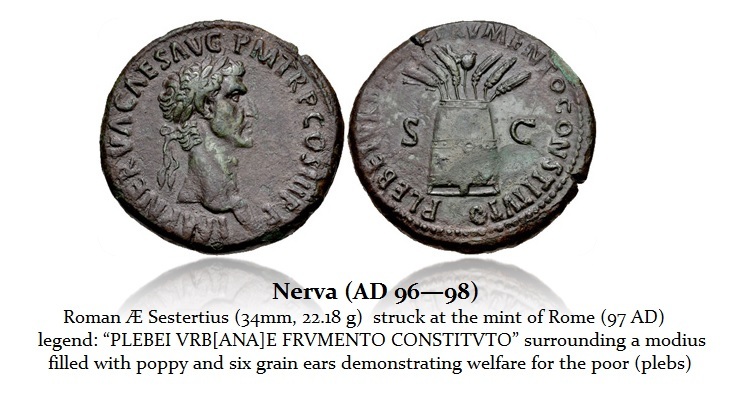 It appears that Nerva remonetized worn outstanding bronze coinage of even several decades old applying a counterstamp “NCAPR” to deal with a shortage of bronze coinage in circulation. His major weakness was that he had been a lawyer with no military experience, which won him only the half-hearted support of the Roman Legions. Nerva’s reign was marked by a second mutiny in 97 AD. There was an attempted coup was made by a nobleman, Gaius Calpurnius Crassus Frugi Licinianus. While the coup failed, Nerva refused to order his execution. Nerva had no children and as such lacked the ability to create a dynasty based upon his bloodline. Nerva thus searched for a candidate who was both wise and with an accomplished military career. 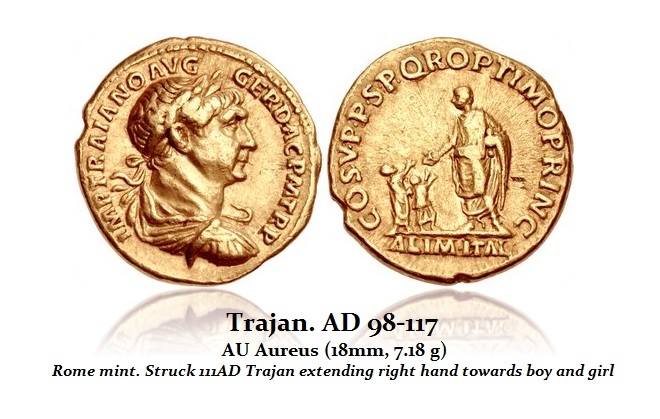 His choice was Trajan who was supported by many generals. Despite being a “provincial” from Spain (born outside of Italy), Nerva adopted Trajan as his son and heir to the throne. 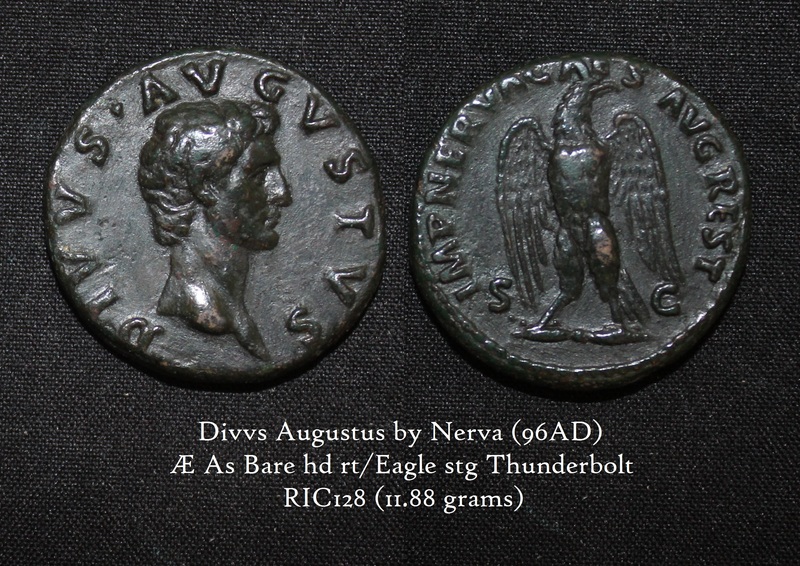 Nerva died on January 25th, 98 AD. Nerva’s system of adopting heirs to insure the best possible candidate would prevail until the reign of Marcus Aurelius. Trajan succeeded Nerva and was hailed Emperor.